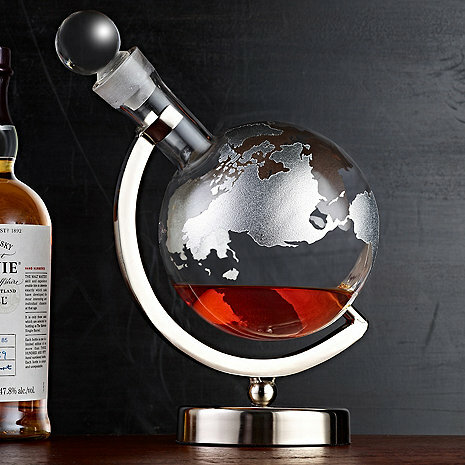 Striking hand-blown glass whiskey decanter with platinum inlayed map makes an impressive statement piece for your home bar or study. The decanter, positioned on a nickel finished metal stand, spins smoothly on its axis, allowing you to admire the richness and color of your favorite whiskey, bourbon, scotch or port. The spin also promotes aeration, allowing flavors and aromas to develop. Fitted glass stopper creates a secure seal for ideal storage, keeping your favorite spirit flavorful and aromatic. Hand wash only. Do two glasses come with the decanter or is it just the decanter? A very elegant piece. So elegant that I have it as my main dining table centerpiece. Every guest must ask where ai got it from. A very good purchase. Very good price for such a quality piece. I received the decanter but it was without the stopper. It was a christmas gift that was wrapped before I inspected it so I was a bit embarrassed. Wine Enthusiast was happy to get the stopper on order as soon as I called them. The customer service was excellent.